Intel is developing a smart wrist device and showing a host of prototype wearable devices at this week's International CES trade show with the hope to find the next big hit. The company has made a range of wearable device in its labs, and a smart wrist device based on an Intel reference platform will go on sale in the U.S., said Mike Bell, vice president and general manager of the New Devices Group at Intel, in an interview. He did not provide a specific date when it would be available. Bell referred to the device as a "smart bracelet" but did not elaborate if it was a smartwatch, pedometer or health monitor. Opening Ceremony is developing a product based on the reference design, which will be sold by retailer Barneys New York, Bell said. Intel is pondering whether to sell the smart bracelet under its own brand name, but for now will let others develop products based on its reference designs, Bell said. It entered the wearable market in September last year when it announced the extremely low-power Quark processor. Intel at the time also said it was developing reference designs for wearable devices based on Quark processors, and would develop multiple wearable devices to see which ones stick. Some of the products that will be demonstrated at CES include a smart earbud, a smart headset, and infant clothing that doubles up as a health monitor. The prototype wearable devices fit naturally on the body, and match form with function, Bell said. "People shouldn't have to adapt to the technology. It should just work, it should have a look that doesn't shout 'ubergeek'," Bell said. The smart earbud measures a user's heart rate and pulse, which the device can communicate to a smartphone to display the results. Based on the heart rate, Intel software can help the smartphone play the right music to boost a user's motivation to exercise. Another wearable device expected to be shown is a smart headset with voice recognition technology, which can work with mobile devices and PCs to organize daily schedules or remind users of events. A complementary technology that will be shown is a smart bowl, in which the smart headset can be placed for recharging. At CES Intel also announced its latest tiny Edison computer for wearable devices. 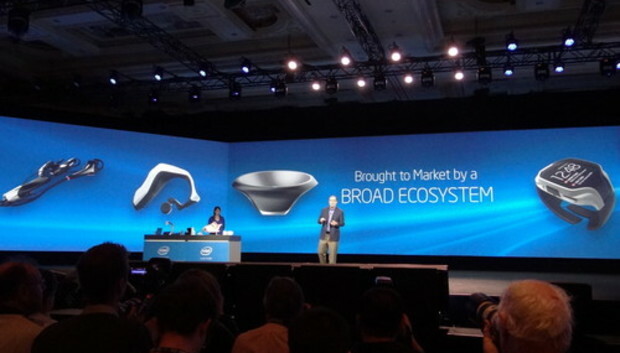 Intel wants to put Edison in wearable products beyond just smartwatches, smart glasses and simple health monitors. Intel will show the Edison chip in baby garments from Rest Devices. The chip will monitor a baby's health by measuring heart rate, temperature and activity. The Edison chip will also be demonstrated in Rest Devices' smart bottle warmer, which will be able to measure liquid consumption by a baby. Intel is still exploring the opportunities in the emerging wearable market, and needs help from the wider community. The company announced the "Make It Wearable" challenge, in which it will award US$1.3 million in prizes to those who come up with innovative ideas on wearable devices.